“America’s No. 1 Children’s Museum” by Parents Magazine, listed among Forbes, LA Times and USA Today’s “Best Children’s Museums in the U.S.,” winner of Houston A-List “Best Museum 2010, 2012, 2013, 2014 & 2015,” Kids Out and About “Top 20 Places to Take Kids in Houston, 2013, 2014 & 2015,” and one of “Houston’s Must See Museums” by Travel Channel, the Children’s Museum of Houston is a Playground for Your Mind™. Children's Museum of Houston was voted America’s No. 1 Children’s Museum” by Parents Magazine and listed among Forbes’ “Best Children’s Museums in the U.S.” It's also the winner of Houston A-List “Best Museum 2012 & 2013," Nickelodeon Parents’ Picks “Best Museum in Houston 2009 & 2010” and a Citysearch.com’s nationwide 5-star children’s museum. It is dedicated to transforming communities through innovative child-centered learning with a vision to spark a passion for lifelong learning in all children. 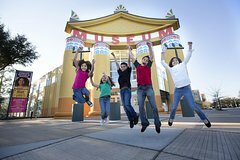 Founded in 1980 and housed in a whimsical building designed by internationally acclaimed architect Robert Venturi, the Children’s Museum of Houston offers a multitude of innovative exhibits and bilingual learning programs for kids ages birth to 12 years.